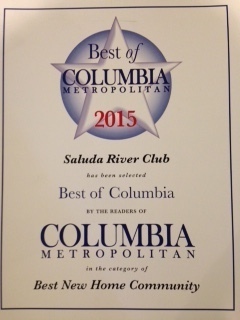 Saluda River Club is honored to be named Best New Home Community 2015 by the readers of Columbia Metropolitan who voted for their favorite places to live, work and play in the Midlands area. Check out the story in the January/February issue. Andy White, developer of Saluda River Club, notes: “We are delighted that, like they also did last year, the readers of Columbia Metropolitan voted Saluda River Club #1. This is a splendid recognition of our master-planned community on the banks of the Saluda River. For directions to Saluda River Club Columbia Metropolitan’s Best New Home Community 2015, and to get more information about living and building at Saluda River Club, call 803-358-3969 or visit www.saludariverclub.com.